So there has been a little craft going on in the background of this little caravan adventure we're on. A little bit of rainbow hooking here and there. Can you guess what I've been making?? This is the before shot. Its the back of Frankie Blue, our caravan, and a clue. Yep, you guessed it! 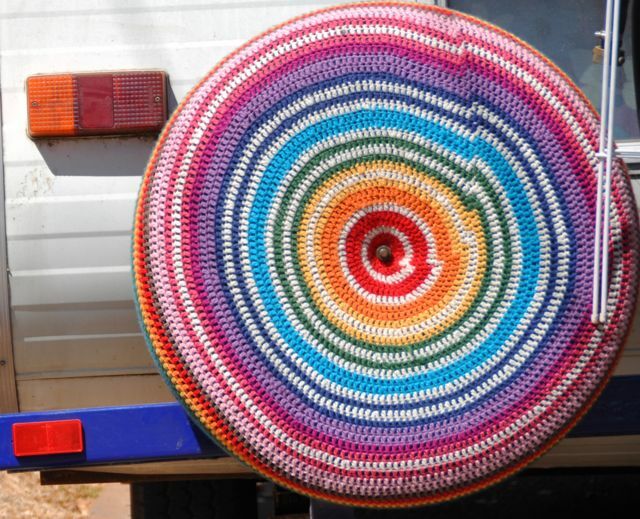 It's a yarn bombed spare tyre cover for the caravan. So much prettier than the boring old black tyre right?! I was totally considering stitching 'Kate, Bren and the gang. Carpe Diem!' or maybe 'Say G'day channel 18 and 40' but I didn't. Frankie Blue insists we drive pretty slowly so there's often trucks, road trains and other vehicles stuck behind us waiting to pass. Oh how I would love to hear what the drivers and their passengers say about our granny van. 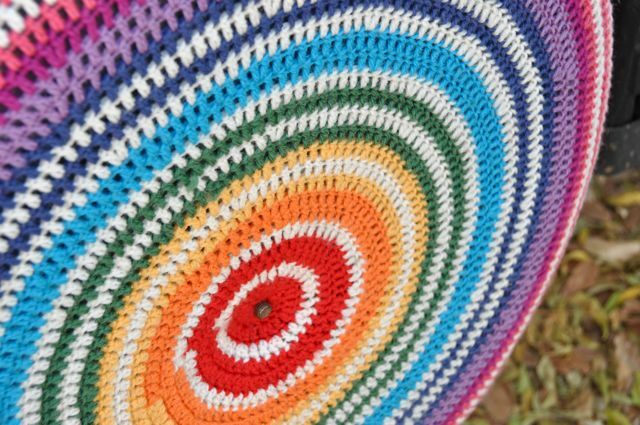 The details are Raveled here and the colours go around and around in a spiral because that's the name Miss Pepper insists on calling our van. We are in Darwin at the top of Australia. It took us one month and 16 caravan parks to get here. I think we'll hang out for a bit. This has made me smile a lot! oh my -that is just too coolfor words! Never seen a wheel as beautiful as this ! Nor did I ever thought I would ever say the word ' beautiful ' to a car wheel!>! Splendid job done! Do you have the ability to generate new ideas, use imagination and make new decision? 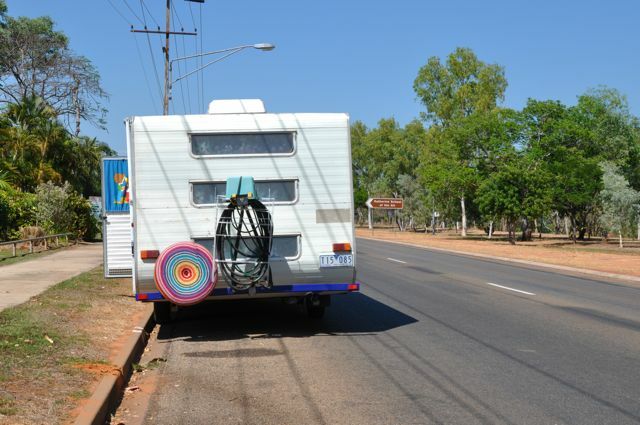 I love the wheel cover and we never got to Darwin wish we had ?Are you comeing back thru Qld? A perfect rainbow spiral - and Frankie Blue looks so much prettier now. I'm sure you'll get lots of smiles along the way! too special! Will be sad when it gets some red dirt! You are a star. Imagine the smiles on faces in cars traveling behind you. You guys just amaze me with your creativity..just loving it! Ha! that is great. You make yourself spottable don't you - what a great way to counter road rage! welcome to darwin. what a great time to be here - festival and all. No doubt you will be at the opening on friday night - can't imagine who won't be! That is so wonderful and funny and uplifting. It's fantastic. No one is going to forget you. It's fabulous! I'm sure it will make lots of travellers smile. Next project ... the hose? Love it to bits, it's beyond awesome. Looks great - how could you not smile when driving behind you guys! Have a lovely time in Darwin and enjoy. That is so cool...I bet the truckies all have a smile on their face when traveling behind you. Happy times in Darwin. 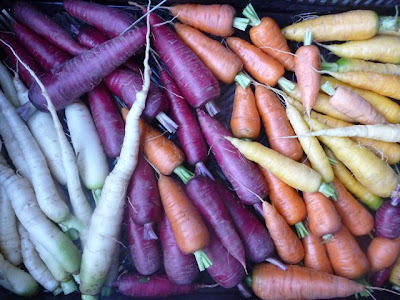 That is just the coolest - it's going straight to Pinterest! Wowee! That wheel cover is groovy. Love it. Really enjoying following your journey thru the outback. You are crazy. It's gorgeous, and you could wear it as a poncho when you are done touring!! Wow it looks great Kate! I am sure the other drivers would love seeing all that bright color. Enjoy Darwin! I've been thinking of getting into a bit of yarn bombing, but it will probably begin rather conservatively...like some pom-poms on the poor, bare, cold looking trees lining my street. 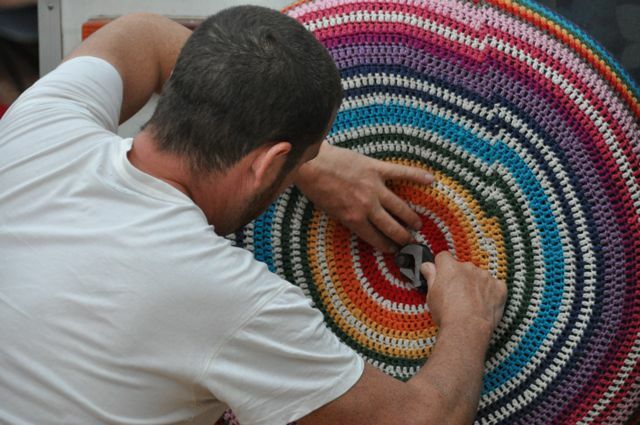 Nothing would be more awesome than travelling behind you guys so I could look at the yarn bombed tyre. Completely and utterly devine. 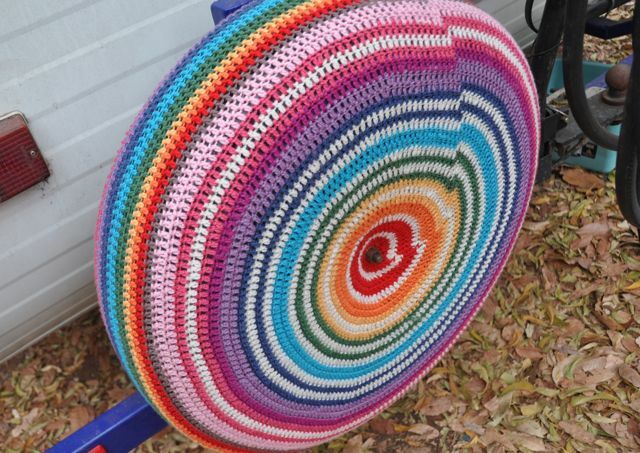 So what are you yarn bombing next? Enjoy Darwin. 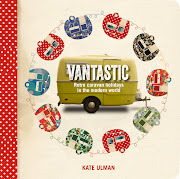 oooooh I love it Kate!! I did wonder what you were making, I could see it growing in the background of a photo!! Brightens up the van immensly. Oh, I just love it!!! I thought at first it was a floor mat which would also rock, love, love, love it!! I can just imagine some tired and jaded driver coming up behind your van and going, what the..???? that is the coolest thing I have ever seen - i LOVE it ! and this is why, my friend, I just fell a bit more in love with you. You make me smile funny girl! Thanks for the colour and joy you spread. Ha! You know I did a (large) spot of yarnbombery. You'll be on the road long enough to bedeck the entire caravan, right? I liove it, and am enjoying reading about your trip. Definately "happy campers" happening! 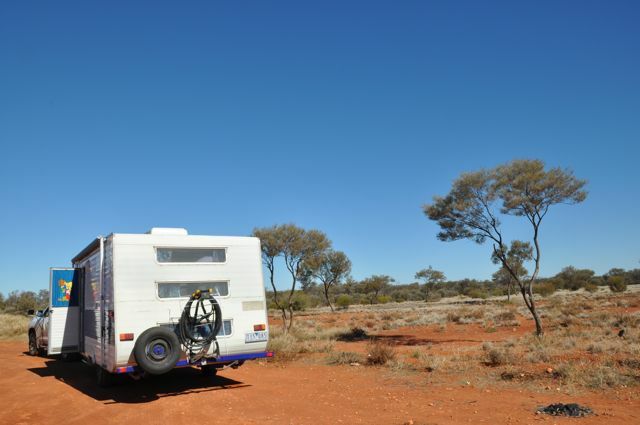 Perfect project for your caravanning trip. LOVE the colour for the spare tyre! It looks great. You've also picked a great time of year to be in Darwin. Its really nice up there in the dry season. Just gorgeous!!! If I passed you on a "circumnavigation of Australia" I'd wanna toot, pull over, whip out the granny tea cups, boil the billy and invite you over for a cuppa and a chat or two!!! LOVE IT! I am loving reading about your trip. I have dreamed about doing exactly what you are doing. (at risk of sounding like a crazy stalker) If you are ever in range of us Laura SA, we'd be happy to put you up ;) in exchange for stories! Kate that is so freaking perfect! Ha -So cool, what a great idea - It makes me laugh just looking at it - bet it does the same for people driving behind you - hard to get road rage looking at that cover. You could embroider on it "Caution: Driver crocheting!" love this! so colourful & happy! i stumbled upon your space here last week, and have been meaning to leave a comment. you have a beautiful and inspiring life :) ! Great work, a great new addition to your van. Don't let it ruin in the rain! Oh my goodness - I cannot even tell you how in love with this I am. Truly delightful. I live in Darwin, so hopefully I will see your lovely rainbow van on the road! Wow Kate, you are having an amazing time, I love your spare wheel cover, I hope it brings many a smile to whom ever is following you. Hello darling - I'm enjoying immensely your traveling blog.. Thanks for sharing the guts of it too - like the bad day. My goodness - the school of life has SO much to teach us, eh? I reckon this could be us in about 4 years. As always - thanks for the inspiration that you share. Greetings from Texas. Whiloe I have seen (and photo'ed a blacksmith anvil welded to a pickup truck trailer hitch, I 've never seen anything as creative and fun as your rainbow cover. Well done. Made me smile! Very cool! I'm inspired to make one of my own. Love the tire cover! I've just been catching up with all your blog posts Kate. I love the way you write - straight from the heart. I never knew what I wanted to tour Australia in a caravan until this evening. So inspiring! How did i miss this!! Fun to the max. Is realy a very colorful to decorate the tire!! Very Cool! lovely idea! lovely colors too!!!! blog website? Thе аccount helped me a acceptable deal. Such granny fabulousness. I love it. It's hard to find experienced people on this subject, however, you sound like you know what you're talking about! diary every day. I'd like to start a blog so I will be able to share my experience and views online. Please let me know if you have any kind of ideas or tips for brand new aspiring bloggers. Thankyou! Yes it is a best option for buying car accessories product at online can be easy in stores. The secret life of caravaners.